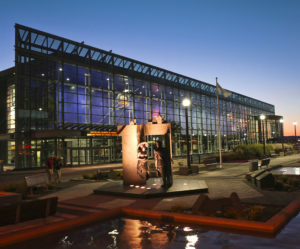 Events held at the Québec City Convention Centre in 2017-2018 generated $101 million of economic impact for the area, a 10 per cent increase over the previous fiscal year. The centre, which is the largest meeting space in the Québec City area, hosted 170 events and 205,000 conference-goers in 2017/18. The year’s meetings included 56 conferences, 18 of them international. The centre’s overall satisfaction rating from clients and attendees topped 97 per cent. Québec City ranks fourth in Canada for the number of international events held, according to the International Congress and Convention Association (ICCA). The Québec City Convention Centre is certified LEED Canada-CI, LEED-BE Silver, BOMA BESt Level 3 and AIPC Quality Standards gold level. It was named World’s Best Convention Centre by AIPC in 2006 and was a finalist for the same award in 2014. A leader in sustainability and quality standards, it was the first Canadian conference centre to offer its delegates, exhibitors and guests free high-speed wireless Internet access with unlimited data transfer.